: Sired by Our Top Winning Male MARU - CLICK HERE for details. Nosferatu Akita & Japanese Akita Inu are owned by Chris & Tina Thomas and are located in the West Midlands. 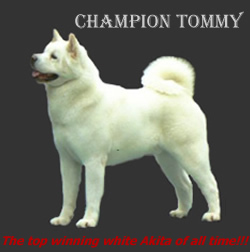 We are pioneers of the Akita (American Akita)and Akita Inu in the UK. We have a wealth of experience, information of breeding, showing and judging. Chris was the first breed specialist to award Kennel Club Challenge Certificates in American Akita in the U.K. The Farmbrook affix was first established in 1976. We have since that date been active in showing and breeding, Old English Sheepdogs, Rottweilers, American Akita Akita and Japanese Akita Inu. We have bred or owned twelve UK Champions and five overseas Champions in these breeds. Chris judges at Championship Show level both in the UK and overseas. He is passed to award Kennel Club Challenge Certificates in all of these four breeds, plus all other breeds including Best in Show at Open Show level. Tina judges Old English Sheepdogs, Rottweilers, Akitas and Japanese Shiba Inu together with all other breeds and Best In Show at Open Show level. Tina also awards Kennel Club Challenge Certificates in Akitas and judges Japanese Akita Inu at Championship Show Level. We are passionate about our dogs and the Nosferatu affix was taken up to be exclusive to these breeds. Although we do not breed puppies often, our aim is to produce Akita and Akita Inu dogs that are sound in both body and temperament, whilst keeping all the attributes of breed type. Without this insight we believe that our breeds will be subject to change by vogue. - don't try to change them - just don't own one."